Cinco de Mayo is almost upon us, the day that commemorates the victory of the Mexican army over the French near the city of Puebla on 5 May 1862. In the U.S., Cinco de Mayo is a day to celebrate Mexican culture. If you know me, you gotta know that I’m down with that & I hardly need any excuse to whip up some Mexican food. I thought I’d celebrate the day with Rick Bayless Brick Red Mole napped over Shredded Barbacoa Beef Enchiladas. Mole is like the king of enchilada sauces. 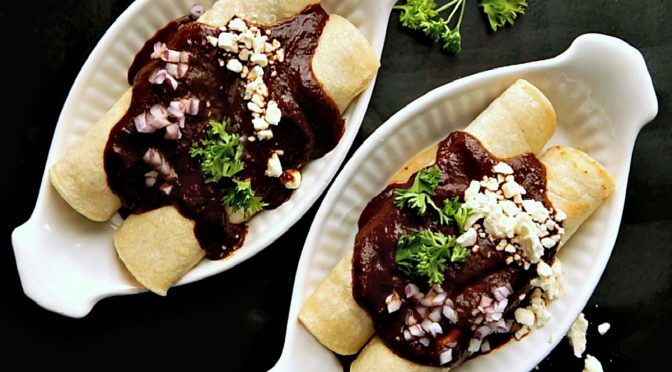 While some Enchilada sauces are super easy (hello Enchilada Sauce from Pantry Ingredients) others, like Mole, can be incredibly complicated with dozens of ingredients and take hours to make. Rick Bayless Brick Red Mole (Mole Coloradito) is kind of in the middle. A bit of a production but no more difficult and probably less time consuming than a home-made spaghetti sauce. All the ingredients for Rick Bayless Brick Red Mole are available at my regular grocery in Minnesota, so I’m assuming they’re available just about anywhere, If you can’t find the dried chiles, use a pure (one ingredient) chili powder. I think that’s available at Target or gosh, I have to say it, Walmart. If there’s no Mexican chocolate, don’t sweat it, just use semi or bittersweet. I’m using this mole over Shredded Beef Enchiladas, but it’s just as good over any Enchilada you can think of. Chicken (rotisserie makes a quick filling but any long-simmered chicken, like one of my Chicken Tinga recipes, are great) or Turkey (enchiladas are a great way to use up leftover Holiday turkey, just sayin’) and you can’t go wrong with a shredded Pork, either a Mexican Shredded Pork or leftover Pulled Pork. Cheese fillings are wonderful, too, like the filling in my Three Cheese Enchiladas in Ranchero Sauce. For this Mole, think of cheese fillings with a white rather than the yellow cheese so often found in our Tex Mex type of Enchilada. Links are at the bottom of the page. Any way you look at it, if you want to make enchiladas from shredded beef, you need shredded beef. That takes time. I try to think about Enchiladas whenever I make any long simmered Mexican dish, whether it’s beef, pork or chicken. I just make a bit more and set aside about 2 3/4 cups to roll inside the enchiladas. That gives me a leg up on the Enchiladas and a way to stretch that first meal into a completely different one. My favorite beef to use in the Brick Red Mole & Beef Enchiladas is my Instant Pot Chipotle Barbacoa Beef. The flavors in the Barbacoa, simple as they are, let the Mole shine. The Instant Pot Chipotle Barbacoa Beef is just as good simmered in a crock pot or slowly braised if you don’t have an IP. I also have a Slow Cooker Barbacoa on my site and a recipe for Mexican Shredded Beef or Pork that can be braised in the oven or made in the Slow Cooker. Any of those recipes will make a great filling for Enchiladas, but if you have another favorite shredded beef recipe of your own, feel free to use that. Again, links are at the bottom of the page. Depending on where you live, around Cinco de Mayo is a great time to pick up bargains on Mexican Food. Here in Minnesota, we often have sales in our store (sometimes unadvertised) on tortillas, taco ingredients and so on. Pick up things that last for a long time in the pantry if you see them on sale. Dried or canned beans, refried beans, canned green chiles, taco & hot sauces, etc. Cinco de Mayo is a great time to think about upgrading your standard grocery store Mexican ingredients and using Queso Fresca and Crema for a more authentic feel. They’re probably on sale, too. The real cost of course, for enchiladas, is usually the filling. I shop carefully and buy on sale proteins for my freezer so I’m always cooking with sales priced ingredients. I am just as careful with my time. When I make recipes that take longer, like just about any type of shredded chicken, beef or pork, I make extra and stash away in my freezer just to use in recipes like this. Anytime you’re making Mexican food, you can’t go wrong with beans and rice as a side. Talk about dirt cheap, too! Try my recipe for doctoring up a can of refried beans to make them taste like they came from a restaurant or my Restaurant Style Mexican Rice. Scroll to the bottom of the page for the links. Rick Bayless’ Brick Red Mole is deep, rich and smoky and so good over just about any enchilada. Choose garnishes of choice to top your enchiladas. On an ungreased griddle or heavy skillet heated over medium, toast the chiles a few at a time until they start to crackle and puff up a bit, even send up a faint wisp of smoke, then flip and press down to toast the other side. Be careful not to burn the chiles; that will make your Mole bitter. Let the chiles cool until they can be handled, then break them open and remove the seeds and stems. In a medium-size bowl, cover the chiles with hot water and let rehydrate 30 minutes, stirring frequently to ensure even soaking. Drain and discard the water. While the chiles are soaking, lay a piece of foil over part of your hot griddle or your hot skillet and lay the tomatoes on it; on the uncovered part, place the garlic. Roast, turning everything occasionally until blackened in spots and soft, 10 to 15 minutes. Cool slightly, then peel off the tomato and garlic skins. On the hot surface, toast the sesame seeds or almonds for a minute or so (the sesame seeds will pop around), then scrape them into a blender along with the tomatoes and garlic. Add the chiles, cinnamon, oregano, pepper, chocolate and 1 1/2 cups of the broth. Blend to a smooth puree, then press through a medium-mesh strainer into a bowl. Turn on the oven to 350 F. degrees. Spray or brush with oil on one side of the tortillas then stack them up on a baking sheet and slide into the oven for just long enough to soften, about 3 to 4 minutes. On a plate, seam side down. To serve the enchiladas, spoon a generous amount of sauce over the tortillas. In a casserole, seam side down. Ladle the filling over, then bake in a 350-degree oven for about 15 to 20 minutes. If you can’t get the dried chiles for this recipe, use about six to seven tablespoons of a one ingredient chile powder. You’ll want a mild one, Ancho is usually pretty easy to find. The don’t toast as directed for the chiles. When you get to the part of the recipe where the oil is heated, add the chili powder and let toast for about a minute and then add the pureed ingredients. Don’t burn the chili powder! I’ll be bringing Rick Bayless’ Brick Red Mole to Fiesta Friday #222, hosted this week by Antonia @ Zoale.com. This entry was posted in Click here for Bargain Meals, Click here for Fabulous Food Posts and tagged barbacoa, Beef, Casserole, enchiladas, Hot Peppers, Mexican or Southwestern, mole, rick bayless, tortillas. Bookmark the permalink. Ah, these photos are stunning! I just realized I haven’t made a mole in a long time. This must change! Wow, that mole looks amazing Mollie! I am going to try this out. My husband loves about any kind of enchilada, and he will be excited about this. Have an awesome Cinco de Mayo and thank you for sharing at Fiesta Friday! My pleasure! I wanted to double it and put some in the freezer but as I was making it, it slipped my mind. I do love this recipe! Oh well done. It is so much better made from scratch and this recipe looks fab. Thanks Virginia! This is one of my fave enchilada sauces. wow – fascinating, healthy, rich and beautiful!!! Thanks much! Mole is always a little special! I am jealous!! I used to know so many people in Chicago but I think most of them have left!! I’d love to eat there. Delicious looking meal. Love that red mole. Thanks! I’ve been meaning to post this forever! I love this Mole!